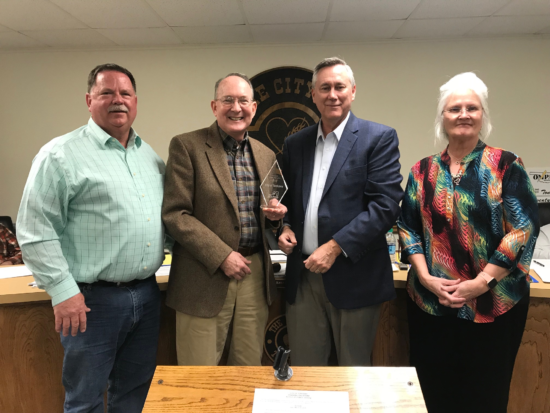 OMPA General Manager Dave Osburn presented the City of Tonkawa with an Our Local Power Champion award at the city’s council meeting in March. The award is meant to recognize the extra effort Tonkawa provided in promoting the Our Local Power campaign. That effort can be seen on the city’s water tower, which was redone during 2018 and painted to include the Our Local Power logo. The Our Local Power campaign began in the fall of 2018 as a way to market the value municipal-owned utilities bring to the communities they serve. It is meant to be a multi-year marketing effort, including all of the 62 municipal-owned utilities in Oklahoma. For more on the campaign, go to ourlocalpower.org.